No need to count sheep while in Beaufort. 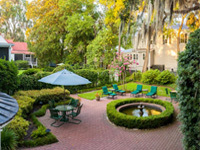 With a variety of historic Bed & Breakfasts, finding a place to rest your weary head is easy. If you are visiting for a week, a weekend, or for the graduation of loved ones, Beaufort offers you many unique choices. Click on the Bed & Breakfast Listings below to find the perfect one for your next vacation, weekend getaway, or graduation trip – and even book your stay online.